In yet another game changing initiative, the Union Minister for HRD, Shri Prakash Javadekar and Union Minister of State for HRD, Dr. Satya Pal Singh launched the Innovation Cell and Atal Ranking of Institutions on Innovation Achievements (ARIIA)at AICTE, New Delhi today. Innovation cell is MHRD’s initiative and has been established at AICTE premises with a purpose to systematically foster the culture of Innovation in all Higher Education Institutions (HEIs) across the country. The primary mandate of Innovation Cell is to encourage, inspire and nurture young students by exposing them to new ideas and processes resulting in innovative activities in their formative years fostered through Network of Innovation clubs in Higher Educational Institutions. While addressing the gathering, Shri Prakash Javadekar said that we must create innovation culture in India and for the same we are encouraging Higher Educational Institutions to create innovation club in their campuses. He also said that without innovation no country can achieve sustainable development and prosperity. The Union Minister also said that 21st century is century of Innovation, and the Prime Minister of India has called the decade 2010-20 as the ‘Decade of Innovation’, to unleash the creative potential of every Indian. India has already been improving on global stage in terms of Innovation ranking from 86th place, 5 years ago, to 57th place this year. He further said that if we want to deliver justice to the poor and make them prosper we need to innovate, without which it is not possible. While talking about young population of the country he said that our young population can be converted into an asset if we innovate and for this reason, innovation is most important. He further said that the establishment of an innovation cell leading to innovation club, leading to Smart India Hackathon and leading to student’s start-ups, are the real eco system which we want to build upon for development of innovation culture in India. The Union Minister said that for the real outcome there has to be some assessment of what is being done to promote innovation. Therefore, Atal Ranking of Institutions on Innovation Achievements (ARIIA) has also been launched today. It will encourage healthy competiveness among Higher Educational Institutions. The Union Minister of State for HRD, Dr. Satya Pal Singh said that innovation must become the part of our culture and it must not be limited only to engineering students, it must be open for other students as well. He said that innovation means original thinking and everyone can contribute their ideas to promote innovation. Secretary (HE), MHRD, Shri R Subrahmanyam, Chairman UGC, Shri D. P. Singh and Chairman AICTE, Shri Anil Sahasrabudhe were also present during the event . MIC will prescribe basic framework for the structure, formation, structure and smooth running of ICs and will soon share list of different activities which ICs need to undertake for the entire academic year. Why HEIs should join ICs Network? Students/Faculty associated with ICs will have exclusive opportunity to participate in various Innovation related initiative and competitions organized by MHRD. Visit new places and see new culture. For India to emerge as a global innovation hub, the youth of our country, especially in higher education institutions (HEIs) need to play a crucial role to create a sustainable innovation ecosystem. Hence, ideally all HEIs should have a comprehensive and functional mechanism to convert research into innovations. This ecosystem will encourage, inspire and nurture young students by exposing them to new ideas and processes resulting in innovative activities in their formative years. To ensure that Innovation is primary fulcrum of all HEIs, Ministry of Human Resource Development (MHRD), Govt. of India is introducing ‘Atal Ranking of Institutions on Innovation Achievements (ARIIA)’ to systematically rank education institutions and universities primarily on innovation related indicators. ARIIA considers all major indicators which are commonly used globally to rank most innovative education institutions/ universities in the world. ARIIA ranking will certainly inspire Indian institutions to reorient their mind-set and build ecosystems to encourage high quality research, innovation and entrepreneurship. More than quantity, ARIIA will focus on quality of innovations and will try to measure the real impact created by these innovations nationally and internationally. Moreover, ARIIA will set tone and direction for institutions for future development for making them globally competitive and in forefront of innovation. 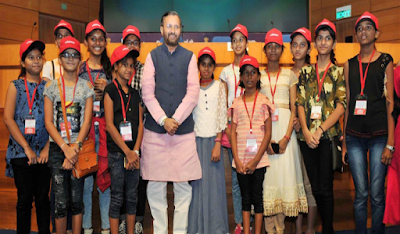 The third edition of World’s Biggest Open Innovation Model - Smart India Hackathon - 2019 launched on Wednesday, 29th August, 2018 at the hand of Shri Prakash Javadekar, Hon’ble Minister for HRD, Government of India, New Delhi. Smart India Hackathon 2019 is a nationwide initiative to provide students a platform to solve some of pressing problems we face in our daily lives, and thus inculcate a culture of product innovation and a mindset of problem solving. In this new edition, students would have the opportunity to work on challenges faced within the public and private sector organizations, and NGOs in addition to government problems pooled from various union ministries. As like in previous editions, Smart India Hackathon 2019 would also have 2 sub-editions – Software edition (a 36-hour software product development competition) and Hardware edition (a 5 days long hardware product development competition). AICTE crafted its Student Start-up Policy and was launched on 16th November 2016 at the hands of Honourable President of India. This policy is designed for the AICTE approved Institutions in accordance with Govt of India’s "Start-up India" Action plan, that was launched on 16th January 2016. AICTE’s Student Start up policy intends to guide AICTE approved institutions to promote student driven innovations and start-ups. The policy aims at identifying the innovative and entrepreneurial potential of students and transforming them into start-up entrepreneurs. This can be done by developing an ideal entrepreneurial ecosystem and promoting strong inter-institutional partnerships among technical institutions, other ecosystem enablers, different stakeholders, programs, market and society.